← OH No! Yoko Release and Real Boys on CITR! Ken Herar has been called a “Champion of Diversity” from Abbotsford Community Services, works as a multi-cultural columnist for the Abbotsford Times. 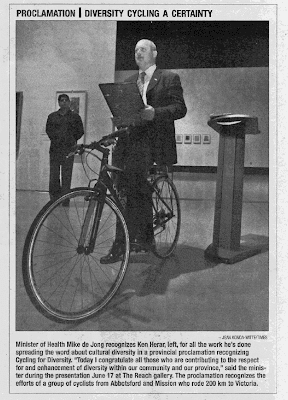 Now Ken has initiated a proclamation from former Attorney General and current Health Minister Mike de Jong on behalf of the Province of British Columbia, recognizing the efforts of the Cycling for Diversity campaign to unite our diverse communities. The campaign took a group of riders from Mission to Victoria, BC in order to promote inclusive dialogue in the region, honouring the World Day for Cultural Diversity for Dialogue and Development, and had already encouraged the District of Mission to proclaim annual recognition of the day when the Province made this recent presentation at The Reach. This entry was posted in Uncategorized and tagged Abbotsford, Abbotsford Community Services, Abbotsford Times, Attorney General, BC, Champion of Diversity, CIVL Radio 101.7 FM, Cycling for Diversity, District of Mission, Healt Minister, Ken Herar, Mike de Jong, The Reach, UNESCO World Day for Cultural Diversity for Dialogue and Development, Victoria. Bookmark the permalink. Amplify Your Community Topping Out Over 12k!